Yu Haibo,Yu Tianqi Kiki, China/Netherlands 2016, 84 minutes Exempt. 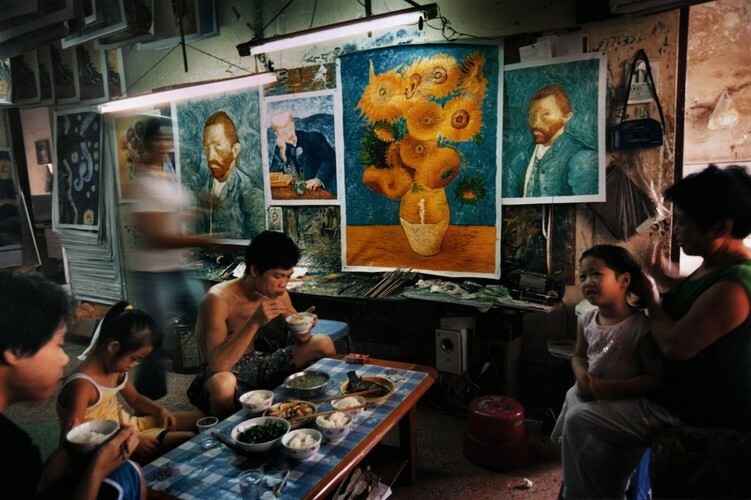 Dafen in Shenzhen, China, open for business since 1988, is now the world's largest oil-painting village, providing employment to some 10,000 painters who produce replicas of the Western canon's famous paintings. Most are destined to be sold in Europe, from street stalls close to the galleries holding the originals. While providing plenty of startling information about the booming trade in replicas and the Chinese labour powerhouse fuelling it, this intimate and compelling portrait zeroes in on a single painter and addresses the conflicting values placed on creativity and authenticity. With orders in the thousands and deadlines tight, painters labour relentlessly, knee-deep in their productions. A former peasant farmer, like many of the villagers, Zhao Xiaoyong has mastered the skills to reproduce Van Goghs.